Every year when winter comes, cities in northern China often have to face serious smog weather. In 2016, the adverse weather began from Chengdu in late November, followed by worsened situations in December in the capital city Beijing and nearby provinces. 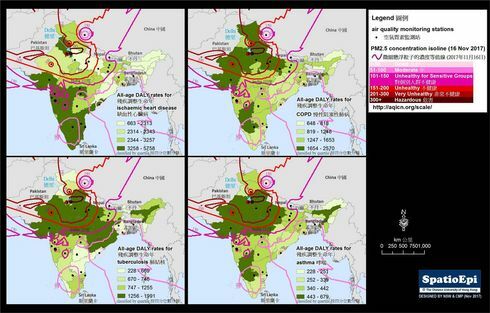 Up to 17th December, a total of 23 cities had issued the "red alert", the highest level of the four-tier smog warning system. Bad weather led to school suspension and air traffic cancellation. Apart from impacting daily life, citizens' health was also seriously threatened. In Beijing, there were reports of children admitted to hospital due to respiratory diseases. The map shows the 23 cities that had issued red smog alert, their respective population size and the atmospheric concentration of PM2.5 reported by China Meteorological Administration on 16th December. The accumulation of environmental pollutants was particularly serious around the capital. 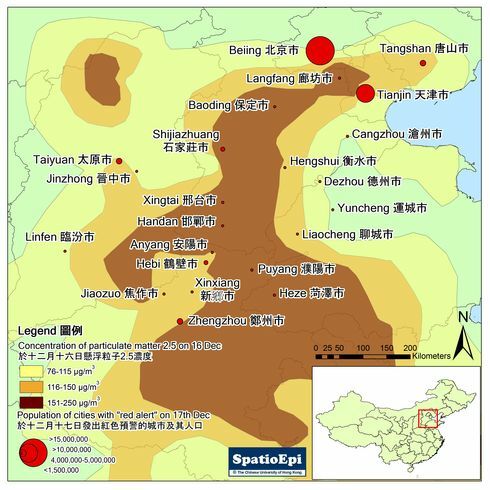 This is the combined effect of (1) intensive pollutant emission from the industrialized and developed North China plain and (2) failure of air pollutants to disperse in the mountainous region in the west. 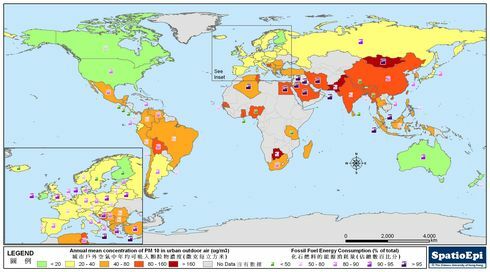 This map was created with data collected from China Meteorological Administration and National Bureau of Statistics of the People’s Republic of China. Particulate matter represents a complex mixture of small particles and liquid droplets suspended in the air. Major sources of particulate matter include construction activities, road dust re-suspension and combustion. Particulate matter with aerodynamic diameter smaller than 10 micrometres (μm) (PM10) is already small enough to pass through nose and respiratory tract and enter our lungs. Chronic exposure to particulate matter increases the risk of cardiovascular and respiratory diseases, or even lung cancer. Those particulate matter smaller than 2.5 μm (PM2.5), also known as fine suspended particles, is especially harmful. It is one of the most important parameters for air pollution monitoring. 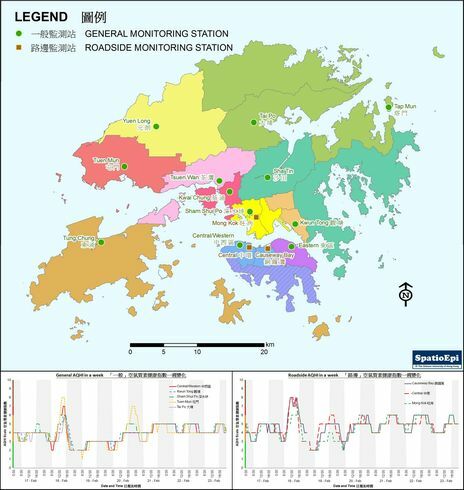 In Hong Kong, Air Quality Health Index (AQHI) was introduced to replace the late Air Pollution Index in December 2013 from Environmental Protection Department, HKSAR. Individuals with lung and heart disease, influenza, asthma, elderly people and children are sensitive to PM. They are advised to reduce physical exertion and outdoor activities and avoid prolonged stay in areas with heavy traffic when AQHI is at high health risk category or higher. Smog (a word formed by combining smoke and fog) is a product of intensive air pollution. In urban cities, combustion of fuels and vehicles on the road lead to the generation of air pollutants. These include particulates, oxides of nitrogen and carbon monoxide, causing diffuse pollution to occur. Occasionally when the wind speed is low and where temperature inversion occurs at higher altitude, pollutants could be trapped at the origin of emission, leading to their accumulation in the air. Sunlight may further trigger reactions and turn some of the primary pollutants into secondary pollutants such as ozone. The resulting smog is toxic and highly oxidizing. Prolonged exposure to smog may cause health hazards such as asthma, cancers, heart diseases and even death. In recent years in northern China, with increasing amount of coal being burnt during winter, smog has become more common. The Ministry of Environmental Protection planned to maintain PM2.5 level below 73 μg/m³ in Beijing-Tianjin-Hebei region by 2017. How does smog warning work in China? 中國的霾預警如何運作?